Home / Accomplishments / Swept Off Her Feet Sweeps Into The Top 100! Swept Off Her Feet Sweeps Into The Top 100! 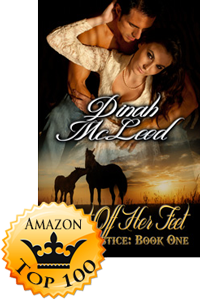 Congratulations to Dinah McLeod, who’s newest release, Swept Off Her Feet, is making some serious waves on Amazon, where it is rocking the Western Top 100 and the Historical Romance Top 100! We’re really excited about the success of the first book in this brand new series! I enjoyed this book very much. It is written in a unique style as the story is told by different characters in the book, with no confusion, as the character name appears as they start. This made for a great read! I loved the characters in this book, especially the women, their antics and jealousy are very believable. I do think Maggie was my favorite though, I see a lot of myself in her because she is so outspoken. They each end up with men that are able to handle them and they do just that. I look forward to the next book in the series! I received this book from Stormy Night Publications as an Advanced Reader Copy.